While the bond market and NYSE margin debt are sending rather bearish signals, the labor market and housing market still seem pretty robust. During the past three months, most of the individual stocks covered in this series outperformed the S&P 500. Despite the stock market being close to its all-time highs and a bullish sentiment, I still am convinced this is not the time to invest long term. After two very bullish months (January and February), the US stock market moved rather sideways in March, but the uptrend since the December lows is still intact (and maybe even the long-term uptrend since 2009). Since the December lows, the major US indices rallied about 20% within a very short time. Readers are probably familiar with my rather bearish opinion (right now and also during the last few quarters). Without denying that there might be short-term opportunities in the market (and also some long-term picks), I still don’t think this is the time to invest in the stock market in a major way. But with stocks once again very close to the all-time highs, one can challenge any bearish opinion, and a close look is always a good idea. In my last article, I already mentioned that the stock market rallied without any fundamental reason. In March, the stock market didn’t rally any more, but the uptrend continued and the discrepancies between the stock market on the one side and other indicators or markets (like the bond market) on the other side are still in place. In this section, we will also look at the three indicators we've examined in past articles - NYSE margin debt, the weekly initial unemployment claims and the yield curve - but we will also look at the consumer sentiment and the housing market this time. Similar to the three indicators already mentioned before, these two can also be called leading indicators which function as warning signals. The labor market is moving similar to the overall economy, and like the stock market itself, the labor market is improving as the economy improves. This leads to a lower unemployment rate as well as to a lower number of weekly initial unemployment claims. Although we saw some spikes on the upside in the past few months and some rather high numbers of initial claims, we have to state that the number of initial unemployment claims is stagnating at a low level (seasonally adjusted), and the last-reported number in March was a new low (202,000 initial claims). For some time, it looked like the labor market formed a bottom and the number of initial unemployment claims was turning, but considering the latest numbers, the labor market is not indicating a recession. As we are only looking at the data of 20 years (and only two recessions), it is a bit hard to generalize statements about the correlation between the NYSE margin debt and the stock market and US recessions. But at least when looking at the past two recessions, we can state that margin debt decreased rather steeply before a recession. 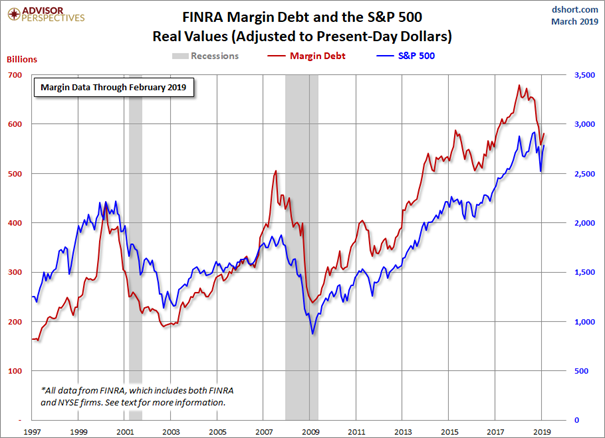 And although the margin debt could increase about 4.9% since the December lows, we also see a rather steep decline which could be a warning signal. 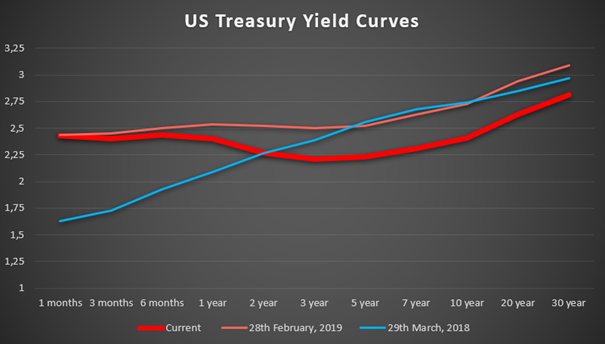 About two weeks ago, the yield curve inverted for the first time since the financial crisis (meaning the yield for the 3-months treasury was higher than the yield for the 10-year treasury). To be clear: the inverted yield curve doesn’t mean there has to be a recession in the near future (there have been false signals in the past), but it is one of the more reliable signals. It is a strong warning signal that a recession might come - nothing more, nothing less. It offers no guarantee for a recession, but it also shouldn’t be ignored. Another indicator that can serve as early warning signal are the building permits. Before most recessions, the number declined - often very sharply. We currently see some small fluctuations to the downside, but compared to the steep declines we saw before most other recessions, we can’t really call it a warning signal yet. And finally, consumer sentiment - measured by the University of Michigan - can also be an early warning signal, but a rather weak one for two different reasons. First, the drop of the indicator before a recession is not as clear as other indicators, and the fluctuations between recessions are also much higher. Second, the decline often happens only a few weeks or months before the recession, and therefore, we have to question its function as an early warning signal. Nevertheless, it is an indicator we can pay attention to, and right now we see a drop, but it is hard to determine if that is the beginning of a recession. About two weeks ago, I published an updated, extensive article about the current state of the market called "U.S. Stock Market: Recession Ahead?" In this article, I wrote more extensively about the weekly initial unemployment claims, what the yield curve means for the economy, and I also wrote about current valuation levels of the market. And to clarify another point: These are all leading indicators and should be considered by investors because they are sending warning signals rather early. Hence, when one or several of these indicators are turning negative, it seldom means a recession will happen right away - in most cases, it took about 9-12 months (in some cases even up to 18 months) before the recession began. But as investors, we should be interested to try and stay ahead of the market (which is difficult). All the individual indicators are always just a hint what might happen. There are indicators which seem to be more reliable (as they have been good leading indicators in the past), and when looking at and interpreting many different indicators, we will get a clearer picture. But these indicators are just hinting at what might happen. During the past three months (from January 1st till March 31st), the S&P 500 gained 14.03% in value. 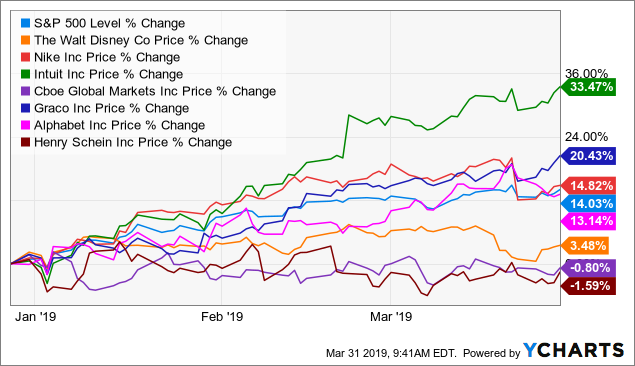 Most of the stocks covered in this series could outperform the S&P 500 as benchmark, with Intuit gaining even 33.47% in the same time frame and Moody’s also gaining close to 30%. 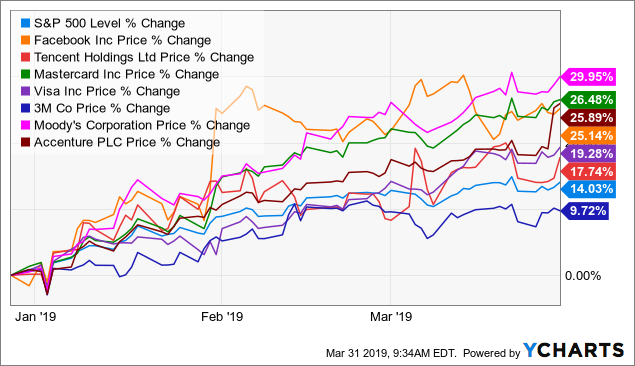 But on the other hand, some stocks underperformed the benchmark, and while Alphabet (GOOG) (13.14%) and 3M (MMM) (9.72%) came close to the performance of the S&P 500, Walt Disney (DIS) (3.48%), CBOE Global Markets (CBOE) (-0.80%) and Henry Schein (HSIC) (-1.59%) clearly underperformed. Overall, we can be confident that we picked great companies that have a high chance of outperforming the major indices in the years to come (despite the fact that some companies couldn’t keep up in the past three months). And although it is a possibility that the stock market will continue to climb in the near future and mark new record highs, this is not the time to buy any of the stocks mentioned in the series. If someone had to buy stocks right now (for whatever reason), he or she might pick Henry Schein or Walt Disney, as those companies are at least trading close to their intrinsic value, but I wouldn’t buy any of them right now. If one is desperately searching for a high-quality business to buy, I would rather look at CVS Health Corp. (CVS) or McKesson (MCK). After it was already fined €6.7 billion in two previous EU antitrust cases, the EU has hit Google once again with a €1.5 billion fine for stifling competition in the online advertisement sector. Aside from the fine, Alphabet will also be affected by the European Parliament’s vote on Article 13, which is going to place heavy restrictions on content sharing and will most likely impact Google’s business (mostly YouTube). However, it is not clear yet if Google might not even profit from the law, as it could lead to an advantage for huge corporations, which can invest heavily in better upload filters. Similar to Alphabet, Facebook will also be affected by the decision of the European Parliament. Aside from that, it was faced with several negative headlines. The company lost two executives, and it was reported that Facebook stored millions of user passwords not encrypted but in plain text for many years, and these 200-600 million user passwords were searchable for 20,000 employees. The terror attack video from the massacre in New Zealand that was streamed live on Facebook also led to a negative debate about the social network. And finally, Facebook reported that is does not see any path forward in China. What is good news for Tencent as it will increase its moat in China and keep the biggest competitor away is a little problematic for Facebook, as China would be the only chance to increase the company’s DAU and MAU in a major way. Aside from some developing countries, the number of users seems to be saturated in most major economies all over the world right now. While Facebook had to deal with some negative press, Tencent reported quarterly results which were rather mixed and showed the effects of the Chinese government’s decision not to approve any new games for several months. Tencent could still increase revenue 28% for the full year and gross profit 12%, but operating profit decreased 33% and diluted earnings per share decreased 32% for the full year. But on the positive side, the combined MAU of Weixin and WeChat increased to approximately 1,098 million by the end of 2018. 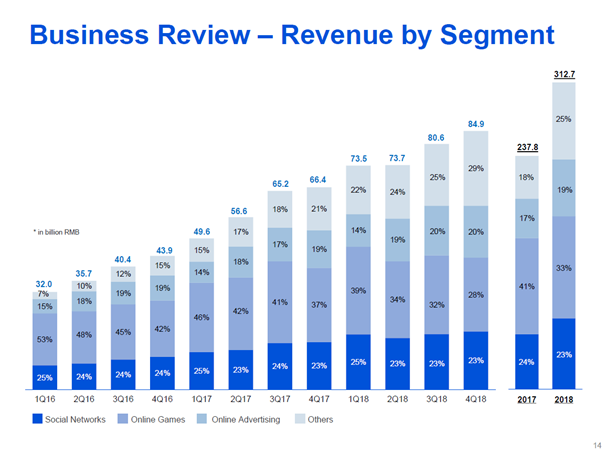 In the chart below, we see how revenue from online games stagnated during 2018 as consequence of the Chinese government's decision. Meanwhile, revenue from “other” increased especially during the last quarters and is now responsible for 29% of total revenue. The company lists its Fintech and cloud service business as “others”, and the segment increased 80% YoY. 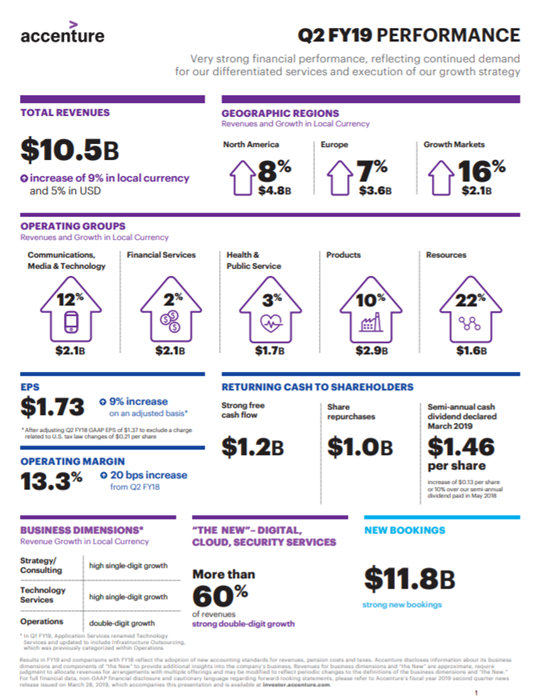 On March 28, 2019, Accenture reported its second-quarter earnings results for 2019. The company could beat expectations (top as well as bottom line), could increase revenue 5.4% YoY and earnings per share increased even 26.3% YoY. Additionally, the company could increase revenue in each of its five operating groups and in all geographic regions. And finally, Accenture updated its business outlook for 2019 and raised its outlook for earnings per share as well as free cash flow. One week before Accenture, Nike also reported its quarterly earnings. Similar to Accenture, the company could also beat expectations for revenue as well as earnings per share. Revenue increased 7% compared to last year’s quarter, and as Nike had to report a loss in the same quarter last year, it doesn’t make much sense to compare earnings per share. Additionally, Nike could improve its gross margin from 43.8% in the same quarter in 2018 to 45.1% right now. Similar to Accenture, the company could report strong earnings, underlining that we are dealing with a superior business. Despite the good results, shares dropped about 6.5% the next day, mostly due to the softer outlook for the next quarter, which will - according to management - be influenced by exchange rates. In my opinion, the high valuation of Nike also plays a role that minor disappointments are enough to bring the stock down. In March, Disney closed its $71 billion Fox deal, acquiring Fox’s film and TV studios as well as the FX Networks and National Geographic. Disney also added Star India to its business. Shortly after the deal was closed, it was reported that more than 3,000 people might be fired as consequence of the deal between the two companies. Aside from 3M announcing that it will now report in four instead of five business segments and Henry Schein reporting that it acquired Lighthouse 360 - a dental practice and patient communication software which won’t contribute to 2019 EPS - Mastercard (MA) and Visa (V) might be affected by the Apple Card (AAPL), and the stocks declined a bit on the news. But as Apple is also partnering with Goldman Sachs (GS) and Mastercard, it shouldn’t be such a big threat for the credit card network. With the labor market sending rather bullish signals, the bond market sending rather bearish signals and the housing market and consumer sentiment being somewhere in between, we have to describe the numbers as mixed. It seems possible that the bull market might go on a little longer, but even if we should see another bullish wave, I am still convinced we are close to the top (especially because of the signals the bond market is sending). Disclosure: I/we have no positions in any stocks mentioned, but may initiate a long position in MCK AND/OR CVS over the next 72 hours. I wrote this article myself, and it expresses my own opinions. I am not receiving compensation for it (other than from Seeking Alpha). I have no business relationship with any company whose stock is mentioned in this article.